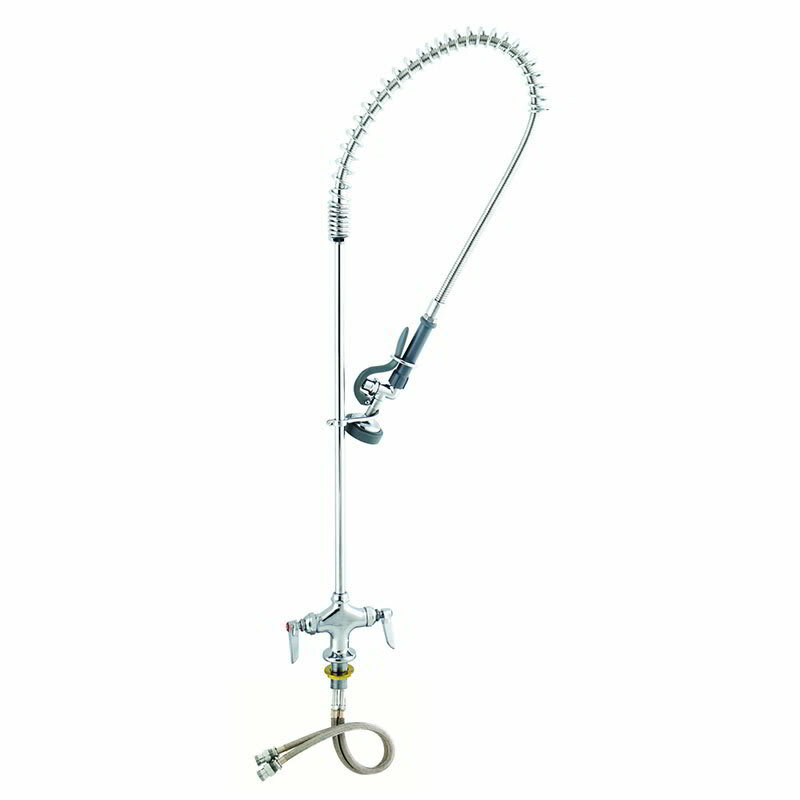 The T&S Brass B-0113 pre-rinse unit has an overhead spring action that holds the hose in an upright position while it is being used. This type of unit is best for general pre-rinsing in a one- or two-compartment sink and for big pots and pans that would not fit under a regular faucet. 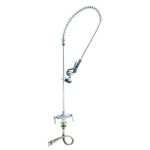 There is a single-hole deck-mount mixing faucet with a polished chrome-plated brass body. The 24-inch riser makes installing the unit fast and easy. With the 44-inch stainless steel hose, rinsing and washing big pots and pans is easier. With a 1.42 GPM flow rate, water heats up to its full temperture in about 30 seconds to comply with health codes. The faucet's quarter-turn Eterna cartridges control the flow of water, and the spring checks in the cartridges prevent the cross flow of cold and hot water. To make things easier on you and you employees, the lever handles are color coded for cold and hot water. The 18-inch stainless steel supply hoses with a 1⁄2-inch NPSM and 5⁄8-inch compression connections bring water from the pipes that are permanently installed behind the walls to the T&S Brass B-0113 pre-rinse unit. "This was a replacement for another very old T & S Pre-rinse faucet. Same high quality. It gets used mostly after bean suppers. Was very impressed..."
"Our church needed to replace a 40 year old pre-rinse faucet. It was easy to find an identical faucet. Then the price was right and the process ea..."
"This was a replacement for another very old T & S Pre-rinse faucet. Same high quality. It gets used mostly after bean suppers. Was very impressed with fast delivery. I am looking for more things to buy from KaTom. I know that I can't go wrong." Easy experience to purchase a superior product. "Our church needed to replace a 40 year old pre-rinse faucet. It was easy to find an identical faucet. Then the price was right and the process easy. It arrived when promised and in good condition. We installed it and it worked great. What more could you ask for. I'll be back in 40 years for another one."